Due to popular demand, Eaglemania returns to the Musikfest Cafe! 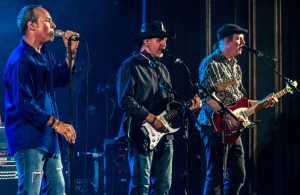 Formed in 2010, Eaglemania has evolved into a nationally touring tribute to The Eagles, performing to sold out audiences everywhere they go. The music of the Eagles appeals to a wide variety of age groups, and the combination of heartfelt ballads, rock anthems laden with guitar harmonies, and the unmistakable sound of vocal harmonies as only the Eagles can do, has propelled the band for the past 40-plus years, positioning them as one of the most successful and popular bands in music history. Eaglemania performs all of the hits of the Eagles, as well as Don Henley, Glen Frey, and Joe Walsh’s solo albums. Their attention to detail and their ability to reproduce the Eagles exactly leaves their fans with an experience that they do not soon forget. People often remark that if they closed their eyes they would think they were listening to the actual Eagles live in concert. The band consists of an ensemble of veteran musicians whose goal is to faithfully reproduce the Eagle’s repertoire, music they love to sing and play, always committed to giving their audience a perfect show every time they take the stage.